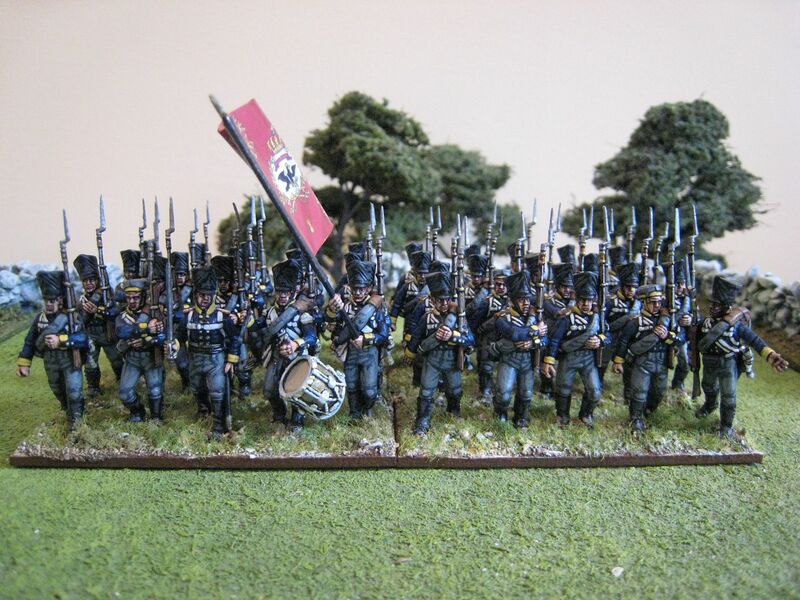 This is the completed first battalion of musketeers of the Prussian 10th Infantry Regiment for 1815. As I understand it, the regular line regiments each had 3 battalions, of which 2 comprised musketeers and the third fusiliers. 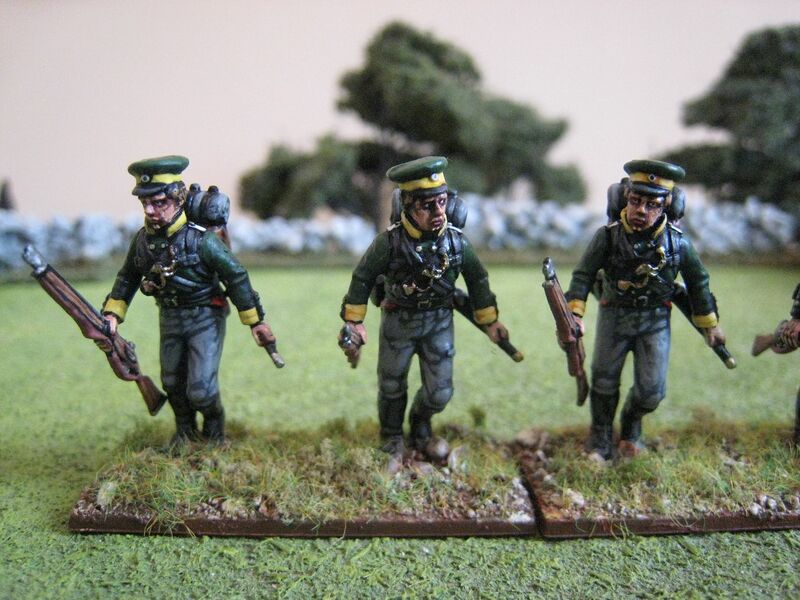 A detahments of volunteers jaegers is also attached to the battalion. 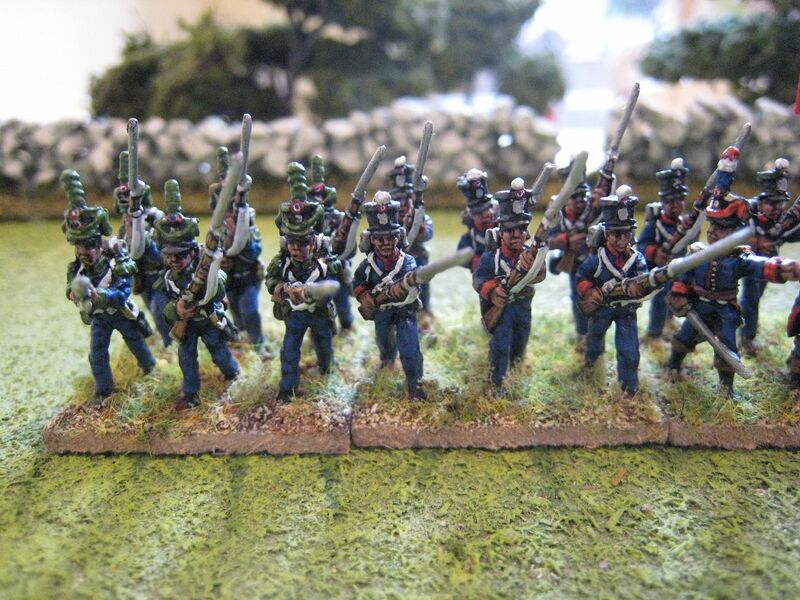 The 10th formed part of von Hacke's 13th Brigade in Bulow's IV Corps. 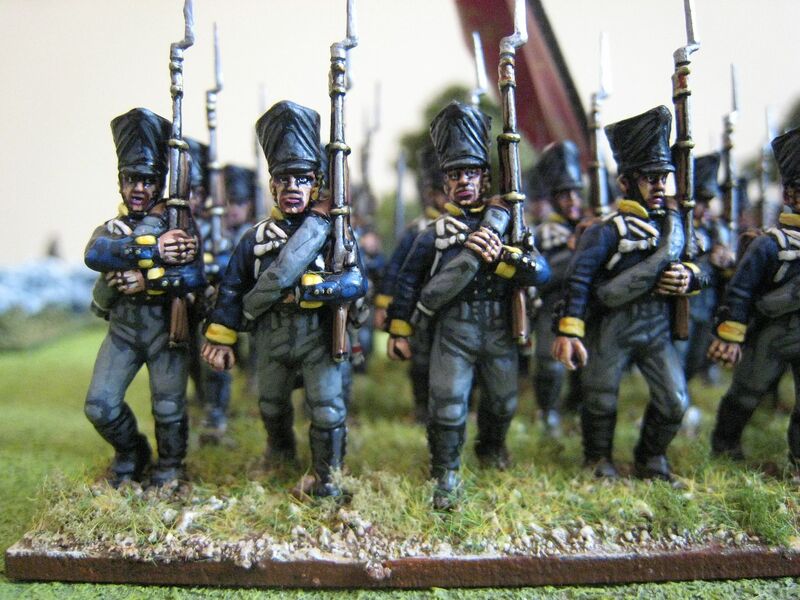 Bulow's troops did not fight at Ligny as they didn't arrive in time, but they were the first substantuial body of Prussians to arrive on the field of Waterloo and were heavily engaged in the battle for Plancenoit. 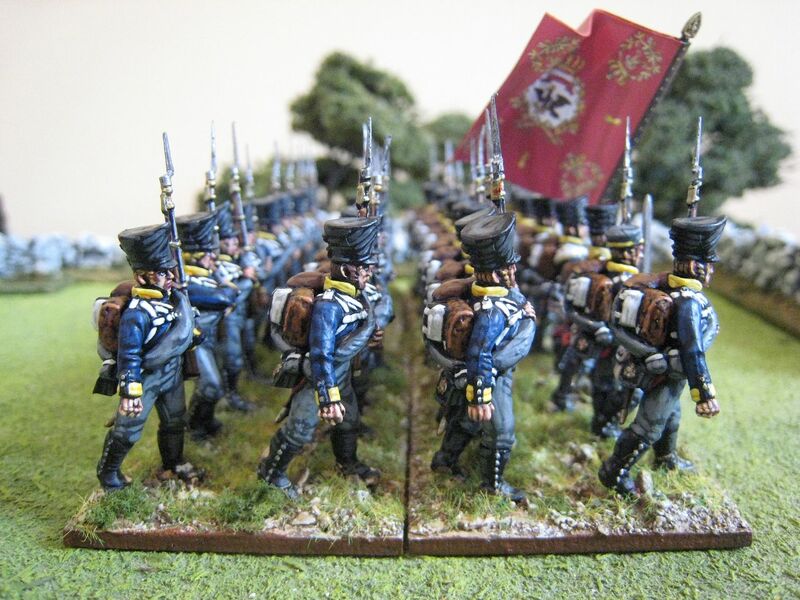 The General de Brigade order of battle that I use for my 1815 units lists most Prussian infantry units at 32 figures. Full strength would be 40 figures, but allowance is made for the loss of numbers as the Waterloo campaign progressed. 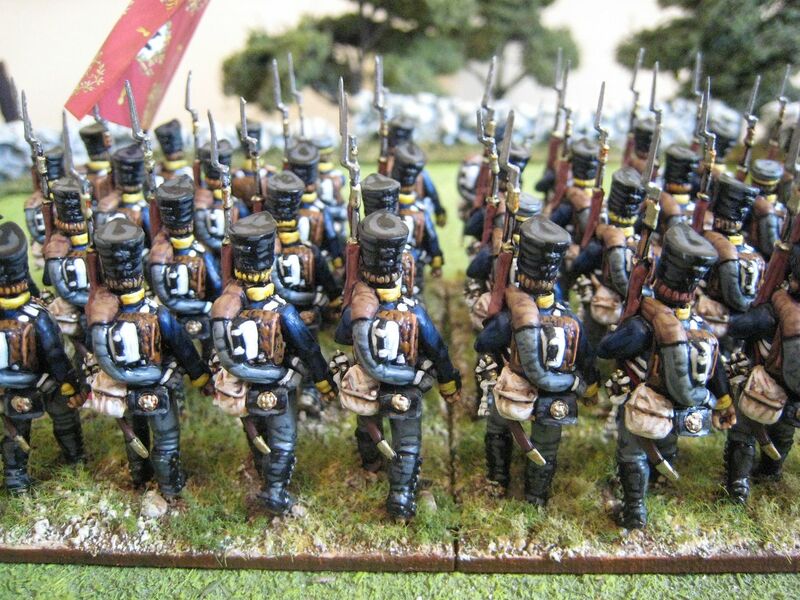 However, on the GdB forum Eclaireur suggested that the 32-figure Prussian battalion may be a bit of a myth and that most infantry units at the start of the 1815 campaign would most likely be close to full strength, albeit then deserving of a reduction as a result of battle casualties at Ligny. However, since the 13th Brigade was not at Ligny I decided that it made sense to keep the 10th Infantry at and full strength and 40 figures. With 4 companies of 10 figures each I had to order some extra-large bases from ERM, which Tony delivered with his customary efficiency. The flag is the one that came with the box. It's a bit thicker than GMB flags and I would suggest using PVA rather than Pritt Stick when gluing it together. The musketeer figures come in 3 parts: the main body, the backpack with half of the greatcoat roll, and the head. I still have the reservations about assembly that I mentioned a while ago when I first started painting these figures. Unless I am doing something wrong, it seems to me that backpack section doesn't quite join the body properly, so that there is a clear gap between the figure's back and the pack. The separate heads are a good idea though, as there are a decent number in the box and you can pose them at different angles to create a lot of variety (which you need in a unit of 40 similarly-posed figures). The jaegers for 10th Infantry require green caps, of which there is 1 head in the box. This is rather limiting for 6 figures, but with different positioning of the heads and eyes looking in different directions you can create a bit of variety; although ultimately they do look rather the same. 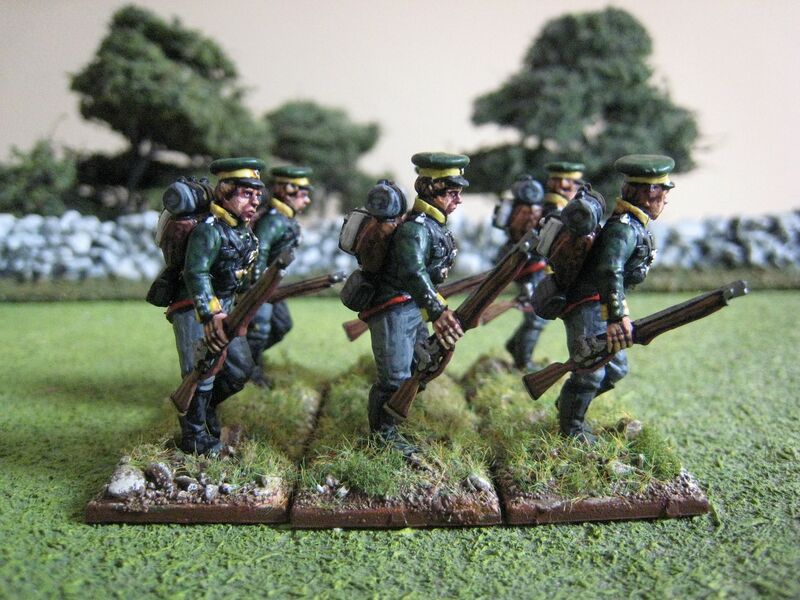 The only other problem worth mentioning is that the unit bases provided are the usual mix of sizes which don't really meet the requirements of the box. The complete box envisages 4 companies of 10 figures, as I have done; but my origami skills were insufficient to work out how the bases might combine together to support 40 figures in close order. I found these figures very quick and easy to paint. The Prussian musketeer's uniform is fairly "minimalist" compared to many other Napoleonic uniforms - no long coat tails, lace or fancy braid, for example. 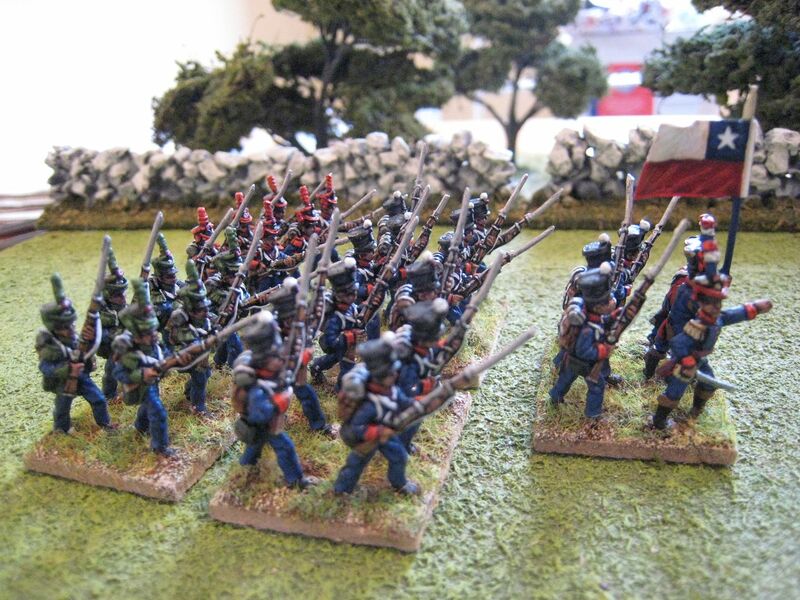 As with the Perries' plastic French infantry, I found that these figures took paint very well and, indeed, they Almost Paint Themselves. 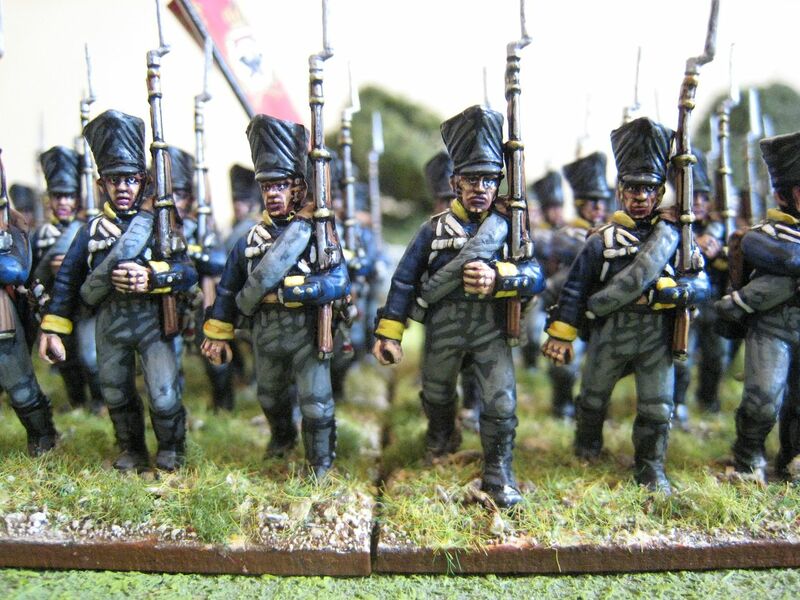 The trickiest parts for me were painting the breeches and the faces. For the musketeers I used the Foundry "Prussian Blue 66" palette with an additionan highlight of "Deep Blue 20 B". The jaegers' coats were painted with the "French Dragoon Green 70" palette (I think) and for the grey breeches/trousers and blanket rolls I used "Stone 57". 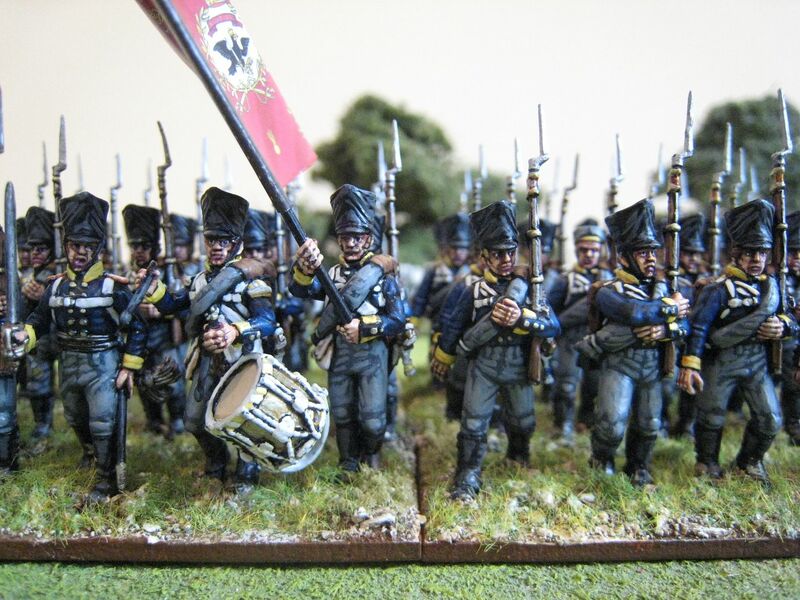 I know next to nothing about the Prussian army of 1815 so I'm sure there plenty of minor mistakes, for which I apologise. All together I am very pleased with these figures. 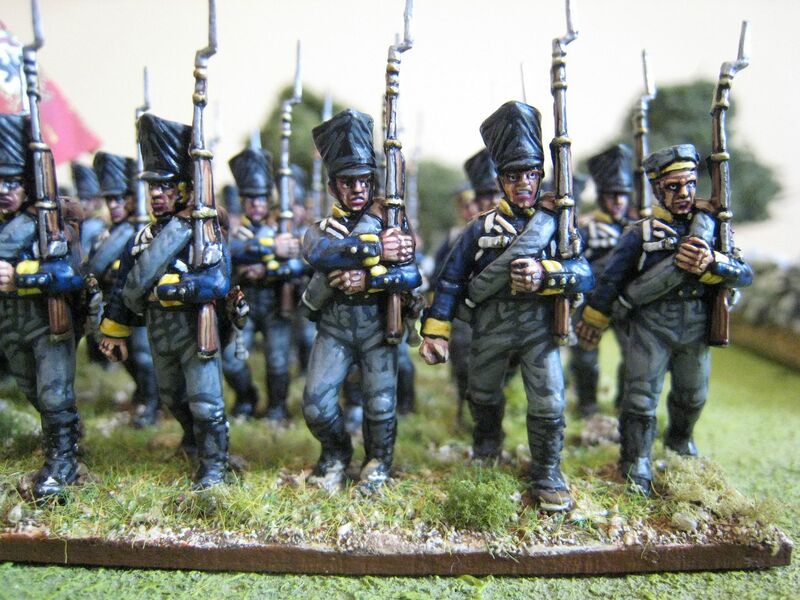 They are cheap and quick to finish, which is exactly what is needed for Napoleonic infantry. Strongly recommended. 46 figures. Painted July and August 2011. I mentioned a while back that I had been painting some 15mm figures, but then didn't post about them. That was because I was trying to think of the best way to do so, and in fact I may yet start a separate blog about this project. For those who don't know, "Liberators!" 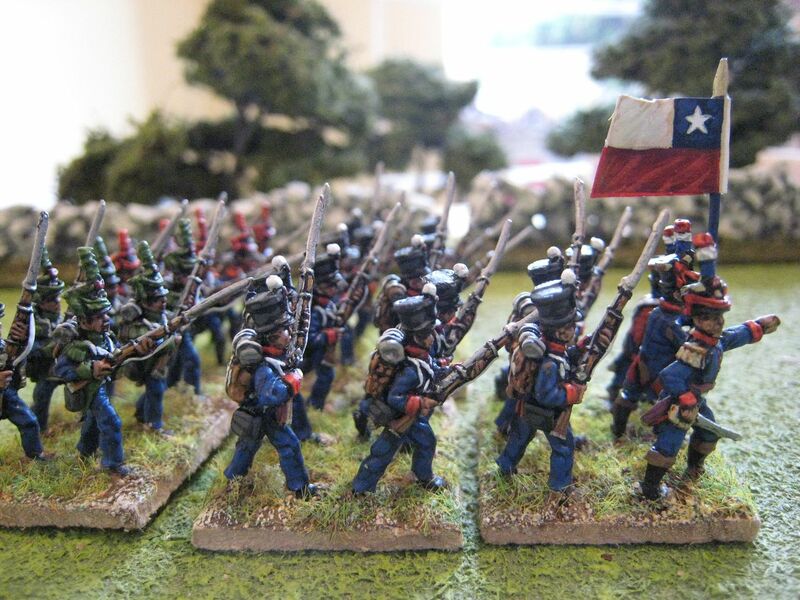 is the name of a series of sourcebooks and associated figures designed for wargaming the wars of liberation fought by the Spanish colonies in Latin America between 1810 and 1830. 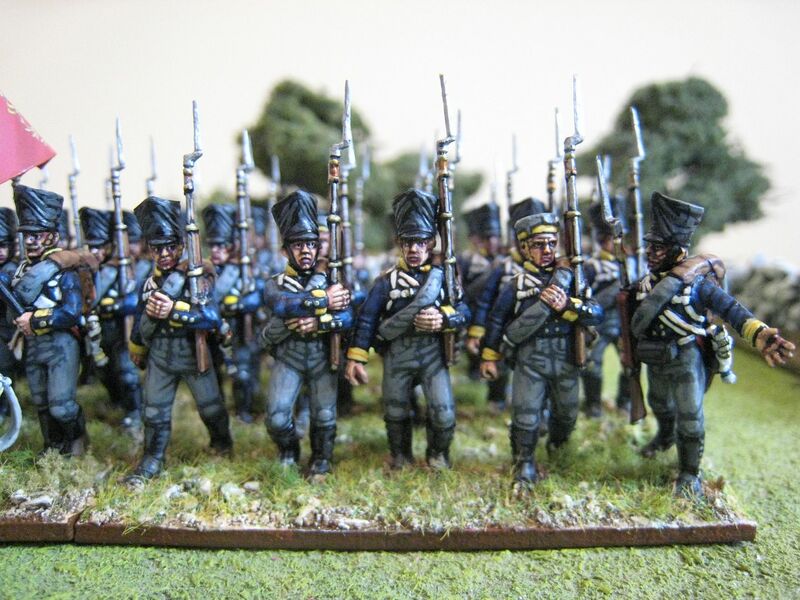 This drive to increase wargamers' awareness of a rather obscure period of history is almost entirely the work of John Fletcher (I say "almost entirely" because the figures are sculpted by Alan Marsh). John runs a blog and a yahoo group as well as the Grenadier Productions website that sell "Liberators!" products. The reason for this post is that John is running a 25% sale over the next few days, so now is a perfect time to jump into this period. 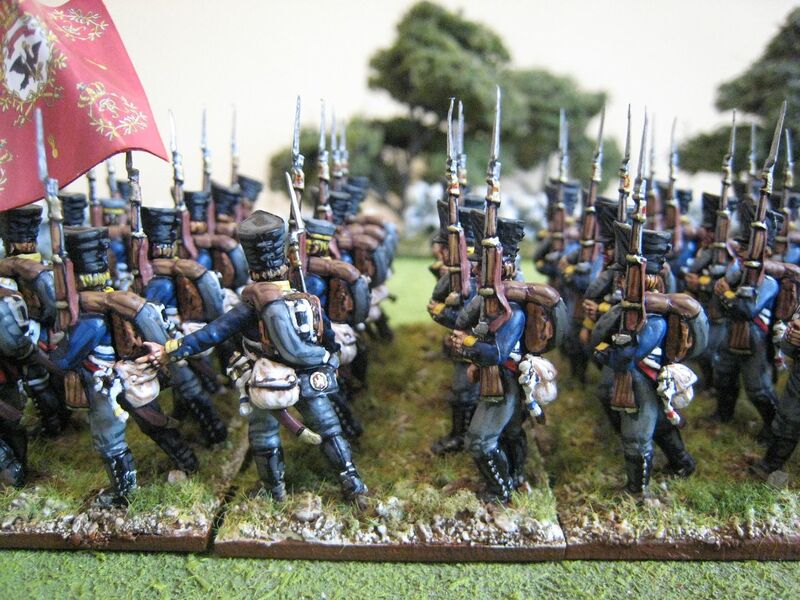 My first serious wargaming began with 15mm Napoleonics, first Essex and Tabletop Games figures and then Battle Honours when they came out in the late 1980s. 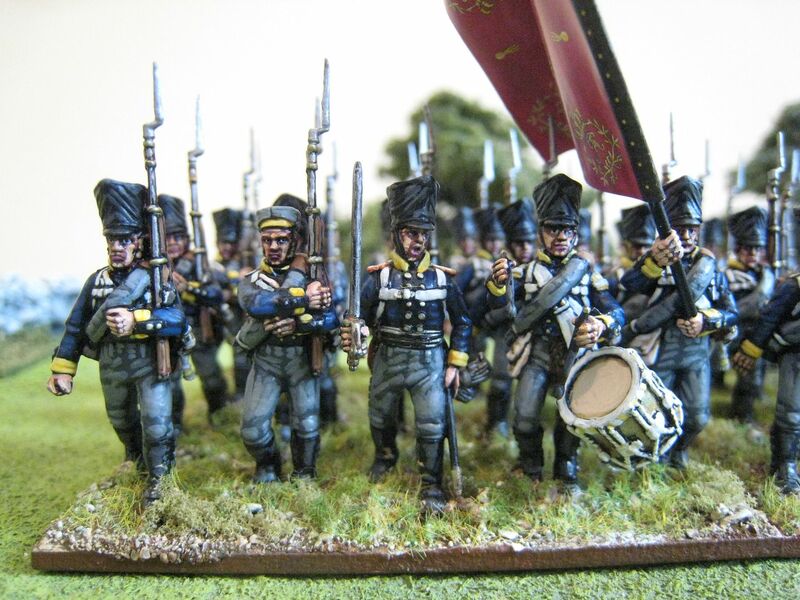 Whilst I painted a fair few 15mm Napoleonics over the years I realised that I much preferred 25mm figures and my 15mm collection never progressed much beyond a handful of painted figures and a reasonably large lead-pile. John's original "Liberators!" sourcebook came out a few years ago and since then I have periodically thought about investigating further as the period is exactly the sort of thing I look for: colourful uniforms, foreign auxiliary forces, small numbers of troops, exotic locations, larger-than-life personalities (e.g. Bolivar and San Martin) and something that's a little bit different. 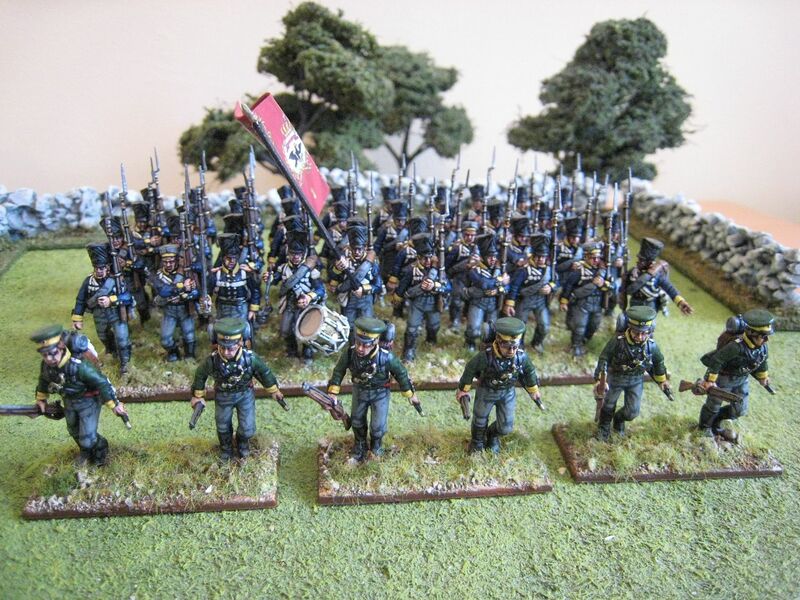 Most important of all, there is the Grenadier range of figures and excellent support on the blog and yahoo group, the latter of which receives contributions from a large number of enthusiasts (such as the chaps who put on the rather cool Maipo demo game at Salute a few years back: see here). I won't go into any historical background now; as I say, I'm trying to think of the best way to take this project forward. 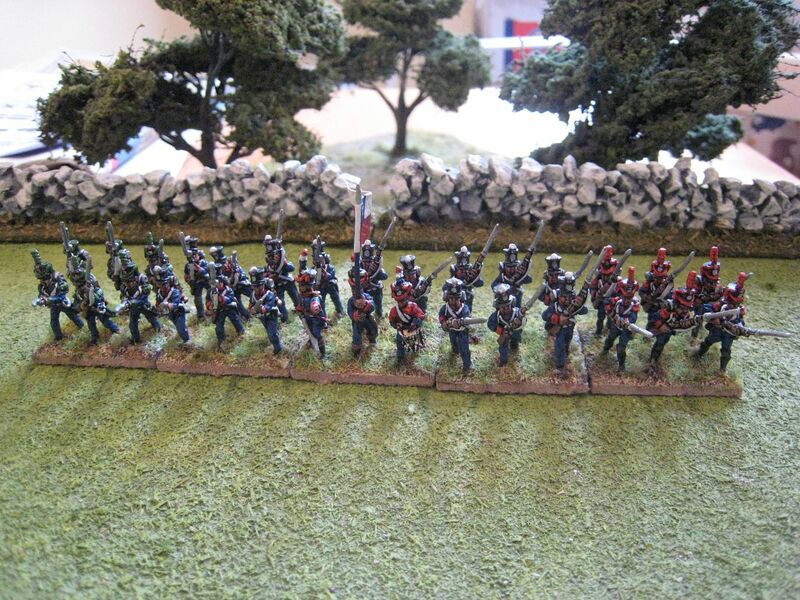 But here are some photos of the first unit I painted up, the First Chilean Infantry Regiment, circa 1818 (a patriot regiment). I'll post better photos in due course. 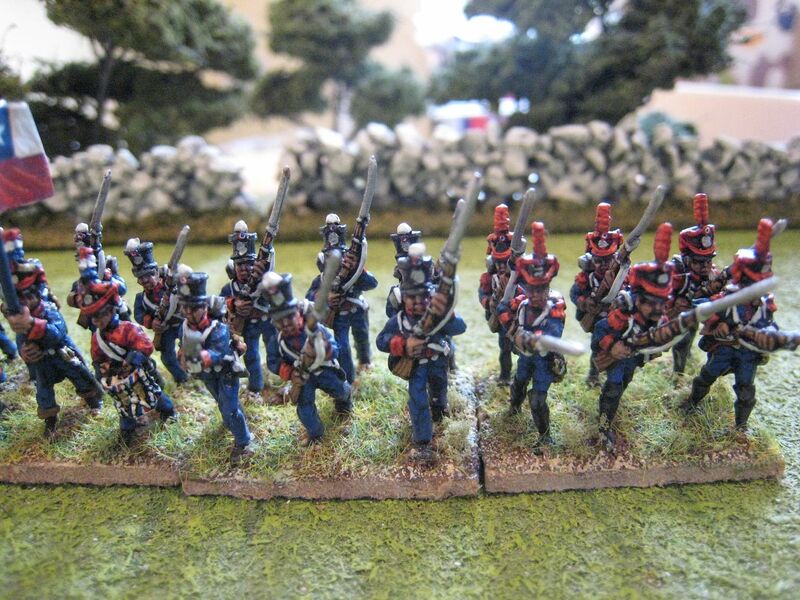 These are based for the "General de Brigade" Napoleonic rules. It's worth also mentioning that Simon at Parkfield Miniatures is sculpting a 25mm line that is shaping up very nicely.